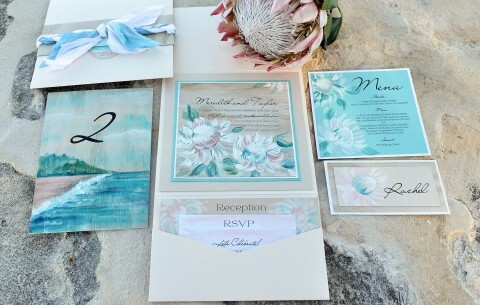 Years of travel to warm and exotic locations inspired Kristy’s Tropical Watercolor Wedding Invitations collection. From the rainforest landscapes of Costa Rica to the billowing Hibiscus blooms of Jamaica, this collection is perfect for those hoping to allure guests with the magic of their wedding location at first invitation glance. Excited to see more Hand Painted Tropical Wedding Invitations? Look on!